How cool it would be to not just read but experience the stories. Watching all characters come to life and get lost in their world. Augmented reality paves the way to have such breathtaking experiences creating real world environment and adding oomph to education making it engaging and interesting for kids. Check out these iOS apps and tools that can aid reading with augmented reality below! 1. AUGTHAT - To enrich and enhance our schools, students, and teachers. Aug That! is an Augmented Reality Educational Company, developed by educators with over 18 years of experience within the public school system. Augmented Reality allows educators and students to do just that: unlock or create layers of digital information on top of the physical world that can be viewed through any smart device be it Android, Apple or Tablet. See how easily teachers or parents can select specific math or reading augmented reality resources that target their students' specific needs. ZooBurst is a digital storytelling tool that lets anyone easily create his or her own 3D pop-up books. Though the tool is more useful for those who want to enhance the creative writing part of the students, if used by teachers for creating stories this tool can be of great use. Educators can put together a story using digital pictures and share it with the students during story time. The free version of the tool currently allows 10 books up to 10 pages each. A free iPad app is available. Premium memberships offer more features--at a price. The app helps elementary level students learn through visual imaging. 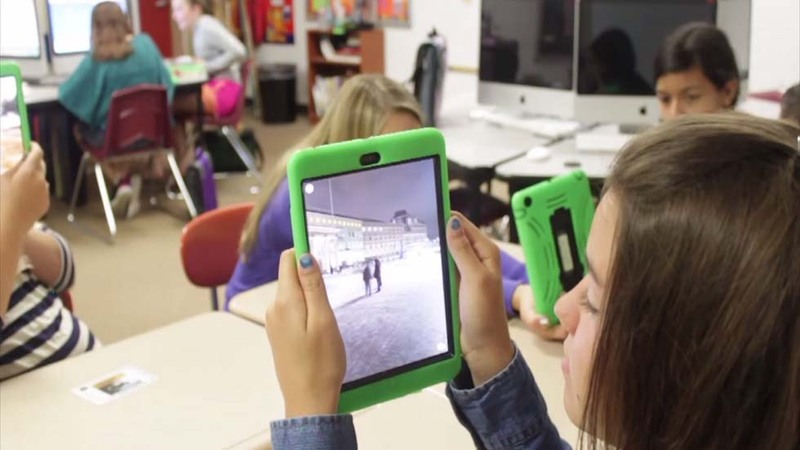 With this app, students get to interact and be engaged as a part of the story. ZooBurst allows you to engage in digital storytelling by designing storybooks complete with 3-D characters. ZooBurst can also be used to help students create presentations and communicate complex ideas which would otherwise be difficult to explain. This app brings the book to life, Two Left Feet by an acclaimed UK Author and Illustrator, Adam Stower into real-life experience. Through the use of 3D augmented reality (AR) technology, children can experience the characters in the book in 3D animations. When the user's iPhone or iPad is pointed at the pages of the book with the app in "Book" mode, animated characters come to life off the pages, while the story is narrated, allowing a child to experience the book. Two Left Feet has won at The Mobies "BEST NEW APP 2013", received The Editor’s Choice Award! "Augmented Reality apps are nothing new, but finding ones that work quite as seamlessly as this does is rare." "The idea of enhancing the book-reading experience with augmented reality is a brilliant one." This storybook app experience from Moonbot Studios is simply amazing. The journey starts with a real or digital book! Once you have purchased your copy of The Fantastic Flying Books of Mr. Morris Lessmore simply point the IMAG•N•O•TRON at it and watch the pages come to life. Get swept up in a storm! Transport to another world! Play music! Fly!!! It’s a wonder of the ages! The IMAG•N•O•TRON app is compatible with the iPhone 4 or later, the iPod Touch 4th generation or later, and the iPad 2 or later. Know more about Augmented Reality in education here. What’s your take on use of Augmented Reality in education? Share your insights and experience with the tools in the comment box.